While I agree that, generally, discretion is the better part of valor, there are times in everyone's life where they just have to be blunt and to the point. This is one of those times for me, so I'm not going to mince words. If you aren't using auto-correct to enter citations in your briefs, you're doing it wrong. Horribly, embarrassingly wrong. Consider this your tough love introduction into saving yourself a lot of time in brief writing. First, for those who don't even know what I mean when I refer to auto-correct, let me explain. You know when you're in Word punching out another stellar brief and you quote a statute, but when you type "(c)" Word unexpectedly and annoyingly changes it to the copyright symbol? That's auto-correct, but it's auto-correct at its worst. You can easily remove that, and then you can add new entries to auto-correct that will save you a lot of time. As for why you should use auto-correct for citations, let me first ask you to answer this off the top of your head: how do you correctly cite to the Special District Local Laws Code? For those of you who don't know, I propose that is why auto-correct can be so useful. For those of you who do know (and we all know there are some), I would propose that storing that piece of information in your head might be taking up space better suited for storing some other, more immediate piece of information, like your anniversary date or what that key that's been sitting in your desk drawer for months now goes to. The main selling point for using auto-correct is how quickly it can enter the basic parts of citations for you, especially statute citations. Everyone knows how tedious and time consuming it can be correctly typing out the abbreviation for a statute and then formatting it correctly (for the die-hards who still use small-caps, of which I am one). 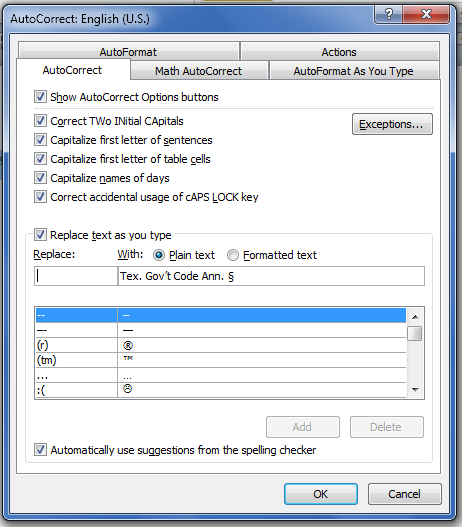 Auto-correct will shorten that process to a few keystrokes. You'll need to do two things. First, type in the short string of text that you will use to tell Word to insert the citation. It can be anything you want, but it should not already be a word. For example, if your shortcut for the Texas Rules of Appellate Procedure were "trap" then Word would insert the citation into places where you were trying to talk about an actual trap. To avoid this trouble, I use a backslash for each of my shortcuts. For the Government Code, I use "\gov". To be honest, I have it in auto-correct twice. The second one is "\govt" because I kept forgetting which one was the right shortcut. Click on the Add button, then click on the OK button. Now create a couple of new lines, and test out your creation. Type "\gov" (or whichever shortcut you created) and press space or enter. Voila! Auto-citation. Yes, you still need to enter the statute chapter and section and the West/Vernon portion of the citation. But this goes a long way in getting you started. Yes, you will need to do this for every citation you use. But that is a one-time cost. Once you do this, you will not have to do this again. Plus, once you know it's right, you know all of your future citations will be right. Use "s3" as a shortcut for "S.W.3d"
Use "\h1" as a shortcut for "(Tex. App.—Houston [1st Dist.]" Also, if you have a client or opposing party whose name is easy to misspell or difficult type out, auto-correct is your friend. Create a shortcut for their name in auto-correct, and you will not embarrass yourself by misspelling your own client's name. Now for you WordPerfect users, I just want to say I'm sorry. The life choices that you have made that have led to your use of WordPerfect in 2013 are ones that I find too difficult to contemplate. Given that, you may not be in a healthy enough mindset to even bother with matters such as auto-correct for citations. But if you are bravely fighting on in what must be a dire situation, I am here to help. I should start by breaking the news to you that WordPerfect will not store formatting settings in quick correct (its version of auto-correct). So you can use quick correct to enter correctly abbreviated statute citations, but you will need to add small caps (if you still use it) to each citation. Nevertheless, it still saves time and reduces errors by not having to look up and type out the statute names. 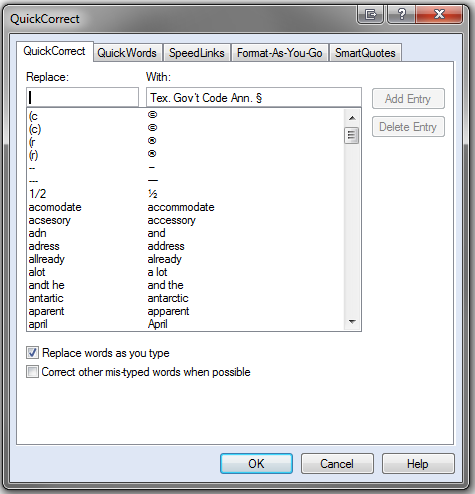 Now, type in the short string of text that you will use to tell WordPerfect to insert the citation. As stated above, it can be anything you want, but it should not already be a word. For the Government Code, I use "\gov" (and "\govt"). Click on the Add Entry button, then click on the OK button. Now create a couple of new lines, and test out your creation. Type "\gov" (or whichever shortcut you created) and press space or enter. Voila! Quick Correct. Yes, you still need to enter the statute chapter and section and the West/Vernon portion of the citation. But this goes a long way in getting you started. For further ideas on how to use quick correct, see the portion about Word, above.